Bhopal: A Prayer For Rain is an account of the events in the run-up to the 1984 gas leak that killed thousands in the Central Indian town of the title. Over 10,000 people are estimated to have died and countless maimed in what is considered the world’s worst human-made industrial disaster. This film aims at chronicling the negligence that led to the tragedy, fuelled by collusion between the US’ Union Carbide Corporation (UCC) and Indian politicians. The dead are not just statistics. Bhopal brings us living, breathing human beings in the form of the impoverished rickshaw-puller Dilip (Rajpal Yadav) who takes up a job in the UCC factory, his wife Leela (Tannishtha Chatterjee), the local journalist Motwani (Kal Penn) who is determined to expose UCC for storing dangerous chemicals in hazardous conditions, and Rekha, the widow of the worker Rakesh who was killed by one of those chemicals much before the leak. When the film is telling the story of the slum dwellers around that Bhopal factory, it is moving and realistic. The poignancy is exacerbated by the fact that, knowing what we know about the night of December 2, 1984, we assume they will be dead by the end of the film. We grow attached to Dilip. And that hurts. This much is achieved even though Bhopal makes some questionable casting choices: Fagun Thakrar as Rekha does not look like a Bhopali slumdweller, and try though he might, the talented Kal Penn is unable to mask that American accent (he was perhaps chosen to add to the film’s international cast with Martin Sheen and a wooden Mischa Barton playing a foreign journalist). However, Rajpal Yadav as Dilip is a perfect pick. As the story rolls along, Dilip realises that the factory is unsafe. He can’t afford to leave though, because of his desperate circumstances. Dilip epitomises the tragedy of Bhopal – of abject poverty, of how corrupt netas and a heartless business empire exploited that poverty. In the portrayal of Dilip, his milieu, Motwani’s crusade and Indian politicians, the film can’t be faulted. The portrayal of the UCC players from overseas is extremely troublesome though. 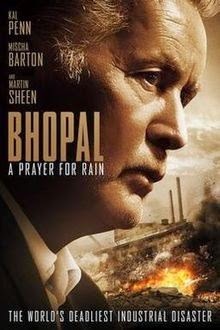 There are three of them in the film: Carbide CEO Warren Anderson (Martin Sheen), Edward “the accounts guy”, and Shane Miller (David Brooks) who is the company’s fixer in Bhopal. They are the big bosses whose larger machinations controlled the goings-on at this UCC plant in India, leading to the leak of the deadly methyl isocyanate (MIC) gas. Yet, the film makes every effort to make them likeable to viewers, while giving the culpable Indians – the factory supervisor Choudhary (Vineet Kumar) and the bribe-taking Madhya Pradesh politician (Satish Kaushik) – a sleazy air about them. The film’s American Nice Guy No. 1 is Shane. He may be shown delivering a bribe, yet he is the voice of everyone’s conscience, constantly slamming Edward’s ruthlessness. Nice Guy No. 2 is Anderson. The Carbide CEO is shown repeatedly justifying negligence at UCC Bhopal; he knows that cost cutting at the factory has translated into unskilled labour being used to run machines requiring expertise; one assumes he knows that the plant’s air-conditioning has been turned off despite the in-house safety officer’s protests; yet Bhopal works hard to get us to like him. The dominant image of Anderson from the film is as a sweet – even if patronising – white man who stops to speak to the little son of an Indian household employee; a jolly old, hard-working, all-American blue collar worker who rose to riches from humble beginnings. These men did not have to be portrayed as cliched villains with fangs and horns. Of course they could have had with shades of grey. But what purpose was served by having Sheen play the Carbide chief with a charming, avuncular air of benevolence? After watching Bhopal twice, I went to the official website in search of an answer and found it in a speech delivered by David Brooks, who is also the film’s co-writer with director Ravi Kumar. Dear Mr Brooks, “The ‘evil corporation’ is too easy” only if you blame them and them alone. And are you actually trying to quietly apportion even a tiny measure of blame to the miserably poor Dilip? Ah, we get it now. Just as Anderson squarely blames UCIL (Union Carbide India Limited) in the film, Brooks appears to favour blaming the Indian government. Of course the role of corrupt Indian politicians in the entire saga is inexcusable and unforgivable. But their amorality can’t be UCC’s excuse. What point is being made by this film when it goes gentle on them? Bhopal: A Prayer For Rain pulls at the heartstrings with its portrayal of the victims of the gas tragedy. It manages to explain what’s going on at the factory without drowning us in jargon. It effectively builds up a sense of foreboding about the impending disaster as chink after chink is revealed in the running of Carbide’s Bhopal plant. That being said, the film’s simultaneous effort to whitewash the wrongdoings of Carbide’s American bosses is repugnant to say the least.